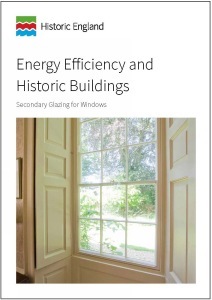 This guidance note provides advice on the principles, risks, materials and methods for upgrading the thermal performance of windows by the addition of secondary glazing. Older windows can often be draughty as over time they distort and gaps open up as joints become weakened. Although adequate ventilation is important in older buildings, excessive air leakage through windows is uncomfortable for occupants and wastes heat. Secondary glazing when carefully designed and installed allows the original windows to be retained unaltered, and where necessary repaired, whilst reducing air leakage and conducted heat losses. As a result there is no loss of historic fabric and in most cases the installation is easily reversible. Research has shown heat losses by conduction and radiation through a window as a whole can be reduced by over 60% by using secondary glazing with a low emissivity (Low-E) hard coating facing the outside. The research has also shown that further savings can be made if the secondary glazing uses insulating frames or incorporates double glazed units. Besides increasing the thermal performance of windows, secondary glazing unlike double glazing can have a number of other benefits including being highly effective at reducing noise. This guidance forms one of a series of thirteen guidance notes covering the thermal upgrading of building elements such as roofs, walls and floors.